As you are choosing your wedding venue by the water, why not take your wedding to the water instead? Everyone knows that a day aboard The Liberté is a special, memorable experience on the water. But what about your special day? As you are choosing your wedding venue by the water, why not take your wedding to the water instead? With a wedding aboard The Liberté, your guests can enjoy a one-of-a-kind experience of witnessing your wedding on the beautiful waters of Cape Cod or the Chesapeake Bay in Annapolis. No matter which seaside town is your favorite, there are so many reasons to plan your perfect wedding day aboard The Liberté this year. When you choose to plan your wedding aboard The Liberté, you are also choosing a beautiful seaside backdrop for your wedding photos. What better place to capture memories of your special day then along the coastline of one of these two beautiful towns? With views of the water at any time of day, along with views of charming historic lighthouses and landmarks, your wedding photos will be just as unique as your special day. 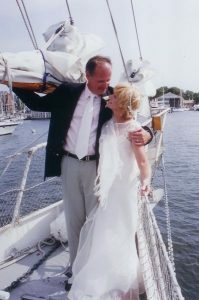 Share your love of sailing and the water with each of your wedding guests aboard The Liberté. With your wedding aboard our beautiful schooner, your guests can enjoy a unique experience as they share in the fun of your wedding day. Whether you choose to plan your wedding for early summer or early fall, you are sure to enjoy a beautiful day out on the water. Make a special memory with your closest family and friends as you enjoy your wedding day on the water this year. Along with the gorgeous views that your guests will see from The Liberté, you and your guests can also enjoy delicious food and music on the water for your reception. Whether you choose to bring your food or work with our catering menu, your guests can eat, listen to music, and create special memories with you on your wedding day. Plan Your Wedding with a Private Charter Aboard The Liberté this Year! This entry was posted on Friday, March 29th, 2019 at 11:06 am. Both comments and pings are currently closed.